Today, it is challenging for customers to automate and configure their infrastructure and applications across their hybrid clouds. To maintain a well-managed environment at scale, the following capabilities are required for both your Windows and Linux systems. Apply and monitor the configuration of infrastructure and applications. Control when and how to apply operating system updates, without unplanned downtime. Resolve alerts, orchestrate backup and disaster recovery, and remediate security issues automatically. Collect inventory and track changes for reporting, diagnostics, and forensics. Automate processes across systems for both Azure and on-premises datacenters. Manage all automation and configuration assets from a secure, centralized repository. To address these requirements, I am pleased to announce the release of new automation and configuration capabilities within the Azure portal. Integration with virtual machines now enables update management, inventory, and change tracking for Windows and Linux computers directly from the VM blade. With update management, you will always know the compliance status for Windows and Linux, and you can create scheduled deployments to orchestrate the installation of updates within a defined maintenance window. The ability to exclude specific updates is also available, with detailed troubleshooting logs to identify any issues during the deployment. The inventory of your VM in-guest resources gives you visibility into installed applications as well as other configuration items you wish to track. Rich reporting and search is available to quickly find detailed information to help understand everything that is configured within the VM. Change tracking delivers automatic collection of changes across services, daemons, software, registry, and files to quickly identify what might be causing issues and to enable diagnostics and alerting when unwanted changes occur. 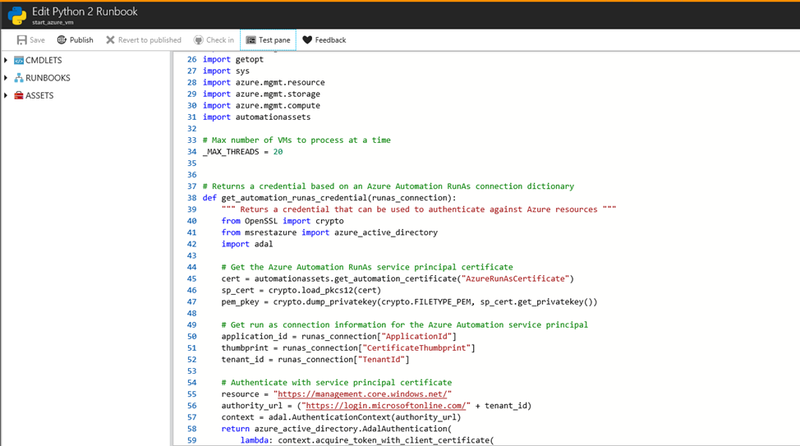 To enable management of your Azure and on-premises resources at scale, these capabilities have also been added to the Automation & configuration service in Azure. You can get a unified view across your entire environment and have the ability to take action to ensure these are correctly configured, updated, and managed from the Azure portal. Automation & configuration in the Azure portal already has configuration management with a PowerShell desired state configuration service. It now also includes the ability to perform update management, collect inventory, and track changes across both Azure VMs and computers running in hybrid datacenters. I am also pleased to announce that we have added the ability to automate Linux tasks by adding hybrid worker support for Linux computers. This means you can orchestrate tasks in your local datacenter and Azure Linux VMs in a consistent way just like you can do for Windows today. We are also announcing the ability to author runbooks using Python, and to have these Python runbooks run from the automation service or on a Linux or Windows hybrid worker. This enables you to use the automation language you are most comfortable with and adds to the existing support for PowerShell and graphical runbooks within the service. Our goal is to enable integrated management of your Azure resources and hybrid environments. With the addition of these new capabilities in Azure, we have changed the cost of using these features so that you pay only for what you need. 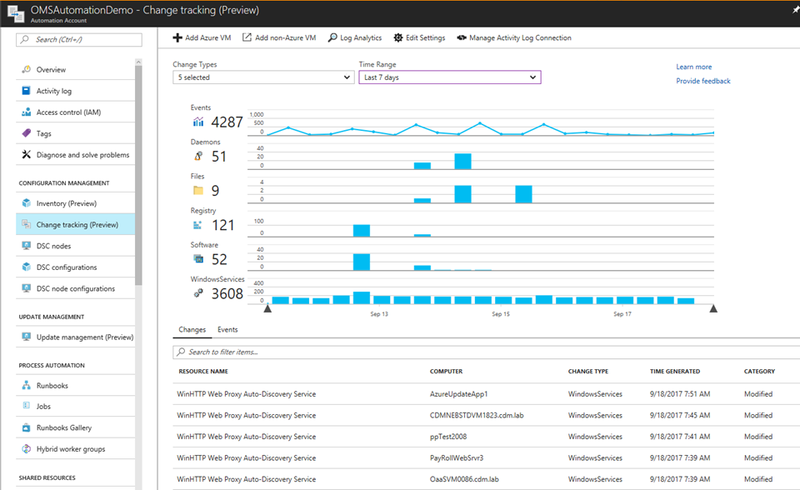 For update management capabilities for both Azure and non-Azure computers, you pay only for the logs stored in Azure Log Analytics. Process automation includes 500 minutes free each month with a charge for each runbook job minute afterwards. Configuration management includes 5 hybrid nodes free each month and then a charge per hour for each non-Azure computer. You pay for the logs stored in Azure Log Analytics. To learn more about the cost for these capabilities, please review the Automation pricing page. To get started with the new capabilities from Automation & configuration, use the virtual machine blade or the Automation account when performing tasks at scale. Learn about the existing and new features on the Azure Automation & configuration documentation pages, and follow Azure Automation on Twitter.